Persona 5, an otherwise wonderful game, definitely has some localization issues. You can find many examples of clunky writing and awkward translation decisions, but this one might be the biggest flub of them all, for a variety of reasons. Nathaniel Chapman, a senior encounter designer for World of Warcraft, pointed out the particular spot on his personal Twitter account this morning. One day while you’re in class, the teacher shows you a Japanese character written in a cursive, free-flowing hand, and asks you what the meaning of the character is. 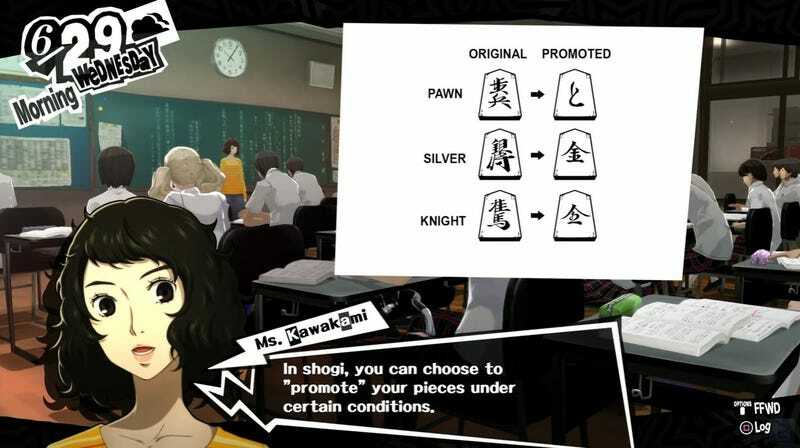 “Regarding the ‘gold’ character in question, in Japan this is a trick question because the cursive kanji of ‘gold’ looks exactly like the standard hiragana ‘to.’ So gold appears to be accurate,” said an Atlus spokesperson. But here’s the rub, as Chapman goes on to point out: even if the translation had been accurate, what the hell is this doing in a game being sold to an American audience? The object in question here is a piece from the popular Japanese board game shōgi—a “minorly tricky” bit of trivia if you grew up in Japan, as Chapman notes, but completely impossible if not. In this case, leaving the question exactly as it is in Japanese would fundamentally alter the player’s experience. This is where the art of localization, as opposed to straight translation, would preserve the experience—had the question simply been removed and replaced with a question about, say, the origins of a chess piece, it would have given American players the same type of challenge as is being presented to Japanese players here.